Blackjack is the world’s most popular casino table game. It’s also very popular online, with millions of people around the world playing it every day. It’s a game not about luck and chance, but about logic and strategy, since the player has to make numerous decisions with every hand that’s dealt. It can be easy for beginners to get to grips with, and it’s good for more advanced players as it allows for them to employ numerous strategies to try to win. 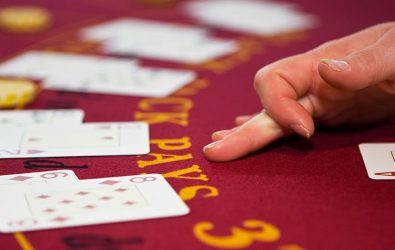 If you’re keen to improve your chances of winning and want to learn some basic online blackjack strategies, look no further. Before you’ve even started playing online blackjack, there’s something you can do to improve your chances of winning. There are lots of different variants of blackjack, each with their own differences in rules and numbers of decks, and each with their own house edge. What house edge refers to is the long-term average profit a casino makes from players’ bets on a game. The lower the house edge, the less money you star to lose on average. It goes without saying that a good strategy is to pick a blackjack variant with a low house edge. Most blackjack games have a house edge of less than 1% and you’ll find that the smaller the number of decks of cards that are in play, the smaller the house edge is. So to give yourself a better chance of doing well at blackjack, don’t play with too many decks and be sure to compare the game you’re thinking of playing with others. This is because you might find other games have a better house edge. It’s best avoiding the games with a house edge over 1% if your ultimate goal is to win. One of the most common, and easiest, blackjack strategies players employ is the use of strategy cards. These cards outline the best decisions players can make in a game, depending on what their hand is and what the dealer’s upturned card is. For example, imagine you’re playing a standard game of blackjack with four decks of cards. The dealer’s face-up card is a 7 and you have a soft total of an Ace and a 3. According to a basic strategy card, your best move would be to hit. There are lots of online blackjack strategy card generators that will create cards offering you advice on what the best move is in a given situation in the game. However, strategy cards don’t tell you what to do with side bets. They also don’t tell you how much your bets should be. Still, beginners should find themselves a strategy card matching the variant of blackjack they’re playing and stick with that. This strategy is sometimes referred to as ‘total dependent’. This is because it takes into account the total value of the player’s hand. This strategy looks at the composition of the player’s hand, rather than just the total of the player’s hand. It’s best played with fewer decks and fortunately, you’ll find single-deck blackjack available at most online casinos. It’s all about knowing what to do when you get a certain combination of cards. For example, say you get a hard 12. You could have any of the following combinations: 10-2, 9-3, 8-4, 7-5. According to blackjack basic strategy, i.e. total dependent strategy, if you get a hard 12 and the dealer has a 4, 5 or 6, you would stand. However, total dependent strategy suggests that if your hard 12 consists of 10 and 2, you should hit or double-down (if the game’s rules permit it). The thinking behind this is that because you have a 10 in your hand, there’s one less 10 in the deck. Therefore, you stand a better chance of drawing something besides a 10. This is just a brief guide to the types of things involved in this strategy. You can find much more detailed guides to it online. A lot of online blackjack games offer players the chance to make side bets. These can be won even if the player’s hand loses. In order to make a side bet, you need to place a wager on a normal blackjack hand. At some online casinos, any side bets are required to be equal to or smaller than the main blackjack wager. You can place side bets on things such as the player’s initial hand being a pair (known as a ‘perfect pair’), the player’s initial hand totalling 20 (‘Lucky Ladies’) or the player’s hand and dealer’s face-up card totalling 19, 20 or 21 (‘Lucky Lucky’). The house edge for these side bets can be considerably higher than the house edge for standard blackjack wagers. For this reason, you should try to avoid side bets. The strategies mentioned above may go some way to help you win. However, it’s still possible for you to win playing normally and not employing a strategy. So long as you understand the rules of the game and think carefully about the decisions you make, you should minimise your chances of losing.